The College of Nursing and Health Innovation is among the nation’s best values in college education for registered nurses who want to earn an online Bachelor of Science in Nursing degree, according to ValueColleges.com. The site's Top 50 Best Value Online RN to BSN list is a guide to the online colleges and universities that find the right balance between quality and price. UT Arlington’s online program ranked No. 6 on the list of programs that are accredited through either the Accreditation Commission for Education in Nursing or the Commission on Collegiate Nursing Association. 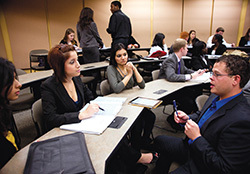 Evaluators looked for a common level of quality, integrity, rigor, and value that translates into a marketable degree. Read more about the nursing value ranking. The College of Business will offer North Texas’ first Executive Delivery Ph.D. with a planned start date of January 2016. Accepted students will complete an initial boot camp in statistics followed by four-day weekend class sessions every six weeks over three years. Students will complete coursework and be in close communication with faculty between each class session. The Ph.D. curriculum and dissertation research will focus on international business. Class sessions are expected to be offered at DFW Airport for convenient access to those not in the North Texas area, and be consistent with the international business focus. Several class sessions will take place in other parts of the world to further reinforce this theme. Asia, South America, and Europe are being considered for international class meeting locations. Read more about the Executive Delivery Ph.D. program. Beginning this fall, students from the College of Nursing and Health Innovation can serve as student nurses through an innovative program in Pasadena, a suburb of Houston. An agreement signed in January established a partnership between the Pasadena Independent School District, UT Arlington, and the UT Health Science Center at Houston for a school-based community health clinical rotation. 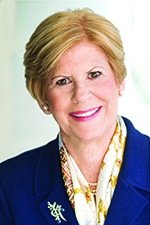 “We are pleased to provide our students with the opportunity to both learn and serve in the critical area of public health at this important phase of their young careers,” says Anne Bavier, dean of the College of Nursing and Health Innovation. Both undergraduate and graduate programs require the nursing students to obtain clinical hours in a variety of rotations such as community health services, surgical/medical, and pediatrics. Pasadena ISD qualifies as a community health services rotation because it is a public school district. Read more about the nursing community health rotation. • The UTA FabLab and Starbucks Coffee in the Central Library are closed through today, Tuesday, July 28, for construction on the library's first floor. • Poster printing in the Central Library is unavailable because of ongoing construction on the first floor. Poster printing is available in Rooms 319 and 324 of the Architecture Building. 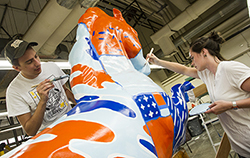 Moises Moura, left, and Elena Chudoba, visual communication seniors, paint the Maverick spirit horse. Their design for the American Institute of Graphic Arts (AIGA) was selected for the 2015-16 design, which will be unveiled at the MavsMeet After Party on Wednesday, Aug. 26. UTA’s student chapter of the Society for Human Resource Management (SHRM) has received a 2014-2015 Outstanding Student Chapter Award for the second year in a row. The award recognizes student chapters that provide exceptional growth and development opportunities to their members. The UTA student chapter has been active on campus and in the DFW community with programs with the Tarrant County Food Bank, Mission Arlington, and Project HOPE. Order your parking permit online beginning Saturday, Aug. 1. Student parking permits are $165 for the 2015-16 academic year. An hourly meter rate is set at $2.50. Read more about the 2015-16 parking permits and regulations. The WNBA announced it would move its Tulsa Shock team to UT Arlington's College Park Center in 2016. The move is pending University of Texas System Board of Regents review. “This adds a new dimension to the growing emergence of UTA in athletics since it will expand exponentially the ways our students can learn from, interact with, and experience the excitement and professionalism of a major women’s sports team," says President Vistasp Karbhari. Read more about the WNBA at CPC and as reported by The Dallas Morning News, WFAA Channel 8, and KTVT CBS 11. About a dozen student teams from across North America converged on the UT Arlington campus for the Texas Autocross Weekend. 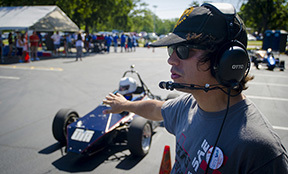 UTA’s award-winning Formula SAE racing team hosted the 15th annual event. See more photos. 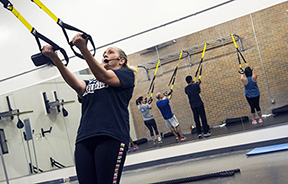 Karen Callas, exercise science senior, demonstrates a movement in the TRX suspension training class she teaches at the Maverick Activities Center. The program leverages gravity and the user's body weight to develop strength, balance, flexibility, and core stability. TRX is a free group exercise class this summer. Last day to drop classes for summer II term. Grade exclusion and forgiveness for summer sessions closes at 5 p.m.
UT Arlington will process grade exclusion and forgiveness requests submitted by 5 p.m. on the last day to drop—Tuesday, Aug. 4—as part of the grading and academic standing process for the summer 2015 term. Grade forgiveness requests must be made through your academic adviser. A list of academic advising offices is online. Submissions are made on the same schedule as grade exclusion. For a grade to be excluded or forgiven, students must be registered at UT Arlington on the census date for the term in which their request is processed. The grade exclusion site will reopen Tuesday, Sept. 15, for the fall semester and be available through the last drop date for the fall. Free Outdoor Movie: 'Dirty Dancing' (1987) Bring a chair or a blanket, a picnic, and friends for outdoor movies each Thursday. Free popcorn. The next movie is Tomorrowland, Aug. 6. Free. 9 p.m., lawn behind the Maverick Activities Center. EXCEL Campus Activities. Arlington Technology Association Robert Edamala, director of information security at UT Arlington, presents "The Internet of Things: How Your Toaster May Be a Threat in Cyber Warfare." Light breakfast provided. RSVP. Free. 7-8 a.m., Room 100, Nedderman Hall. Arlington Technology Association. The Sun Belt Conference recently honored 86 UTA student-athletes for their academic success during the 2014-15 school year. Thirty-eight Mavericks were named to the Sun Belt Commissioner’s list for posting a GPA of 3.50 or higher, while 48 made the Academic Honor Roll for having GPAs between 3.00 and 3.49. UTA athletes compiled a 3.055 cumulative GPA in 2014-15. Women’s tennis led the way with a 3.537 GPA, while women’s basketball was second with a 3.177. • The women’s basketball team has added transfer guard Kamy Cole for the 2015-16 season. She previously played at TCU, where she averaged 9.8 points per game, fourth in the Big 12 among freshmen. • The men's and women's 2015 cross country schedule kicks off Tuesday, Sept. 1, at the Baylor Twilight Invitational in Waco. UTA will host the annual Gerald Richey High School and University Invitational on Saturday, Sept. 19. The meet will be held at Lynn Creek Park in Grand Prairie and will begin with university races at 8 a.m.
• The Maverick Open, formerly the Chip-N-Classic, will take place Thursday, Sept. 10, at Texas Star Golf Course in Euless. To reserve your place, contact Kris Wood at kriswood@uta.edu or 2-9613. The last summer intramural sports deadline is MavStrong competition, Thursday, Aug. 6.